As Aryan society became more complex, their society became divided into groups. For the most part, these groups were organized by people’s occupations. Strict rules developed about how people of different groups could interact. As time passed, these rules became stricter and became central to Indian society. The Brahmins were seen as the highest ranking because they performed rituals for the gods. This gave the Brahmins great influence over the other varnas. The Buddha declared his teachings to destroy this system. But after his death, the Brahmans who lost their benefits restored this system by adapting with the Buddha’s teaching and calling a new doctrine “Hinduism” that means “The Religion of India”. As the rules of interaction between varnas got stricter, the Aryan social order became more complex. In time, each of the four varnas in Aryan society was further divided into many castes, or groups. This caste system divided Indian society into groups based on a person’s birth, wealth, or occupation. At one time, some 3,000 separate castes existed in India. This may make Siddhartha Gautama prince seek for solution. Both men and women belonged to castes. Early in the Aryan period, women had most of the same rights as men. They could, for example, own property and receive an education. Over time, however, laws were passed to limit these rights. The Buddha sought for these solutions. By the late Aryan period, a segment of early Indian society had developed that did not belong to any caste. This group was called the untouchables. They could hold only certain, often unpleasant, jobs. To keep their classes distinct, the Aryans developed sutras, or guides, which listed all the rules for the caste system. For example, people were not allowed to marry anyone from a different class. It was even forbidden for people from one class to eat with people from another. People who broke the caste rules could be banned from their homes and their castes, which would make them untouchables. Because of these rules, people spent almost all of their time with others in their same class. Religion had been an important part of Aryan life even before the Aryans moved to India. Eventually, in India, religion took on even more meaning. Because Aryan priests were called Brahmins, their religion is often called Brahmanism. Aryan religion was based on the Vedas. There are four Vedas, each containing sacred hymns and poems. The oldest of the Vedas, the Rigveda, was probably written before 1000 BC. It includes hymns of praise to many gods. This passage, for example, is the opening of a hymn praising Indra, a god of the sky and war. Over the centuries, Aryan Brahmins wrote down their thoughts about the Vedas. In time these thoughts were compiled into collections called Vedic texts. One collection of Vedic texts describes Aryan religious rituals. For example, it describes how sacrifices should be performed. Priests placed animals, food, or drinks to be sacrificed in a fire. The Aryans believed that the fire would carry these offerings to the gods. A second collection of Vedic texts describes secret rituals that only certain people could perform. In fact, the rituals were so secret that they had to be done in the forest, far from other people. The final group of Vedic texts are the Upanishads, most of which were written by about 600 BC. These writings are reflections on the Vedas by religious students and teachers. 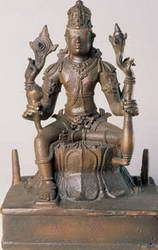 The god Brahma represents the creator aspect of Brahman. 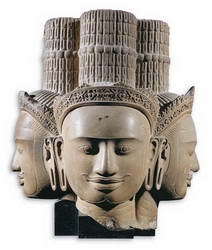 His four faces symbolize the four Vedas. 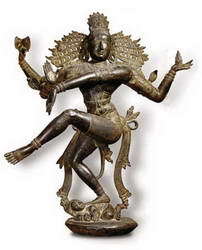 Siva, the destroyer aspect of Brahman, is usually shown with four arms and three eyes. Here he is shown dancing on the back of a demon he has defeated. The Vedas, the Upanishads, and the other Vedic texts remained the basis of Indian religion for centuries. Eventually, however, the ideas of these sacred texts began to blend with ideas from other cultures. People from Persia and other kingdoms in Central Asia, for example, brought their ideas to India. In time, this blending of ideas created a religion called Hinduism, the largest religion in India today. The Hindus believe in many gods. Among them are three major gods: Brahma the Creator, Siva the Destroyer, and Vishnu the Preserver. At the same time, however, Hindus believe that each god is part of a single universal spirit called Brahman. They believe that Brahman created the world and preserves it. Gods like Brahma, Siva, and Vishnu represent different aspects of Brahman. In fact, Hindus believe that everything in the world is part of Brahman. According to Hindu teachings, everyone has a soul, or atman, inside them. This soul holds the person’s personality, the qualities that make them who they are. Hindus believe that a person’s ultimate goal should be to reunite that soul with Brahman, the universal spirit. Hindus believe that their souls will eventually join Brahman because the world we live in is an illusion. Brahman is the only reality. The Upanishads taught that people must try to see through the illusion of the world. Since it is hard to see through illusions, it can take several lifetimes. That is why Hindus believe that souls are born and reborn many times, each time in a new body. This process of rebirth is called reincarnation. According to the traditional Hindu view of reincarnation, a person who has died is reborn in a new physical form. The type of form depends upon his or her karma, the effects that good or bad actions have on a person’s soul. Evil actions will build bad karma. A person with bad karma will be born into a lower caste or life form. Remark: Unlike Hinduism, Buddhism teaches that everything has in the form of the compound things, this has because this has, this extinguishes because this extinguishes. A person who is born in any caste can develop him by training and learning. In contrast, good actions build good karma. People with good karma are born into a higher caste in their next lives. In time, good karma will bring salvation, or freedom from life’s worries and the cycle of rebirth. This salvation is called moksha. 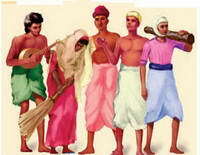 Hinduism taught that each person had a dharma, or set of spiritual duties, to fulfill. Fulfilling one’s dharma required accepting one’s station in life. By teaching people to accept their stations, Hinduism helped preserve the caste system. Although Hinduism was widely followed in India, not everyone agreed with its beliefs. Some unsatisfied people and groups looked for new religious ideas. 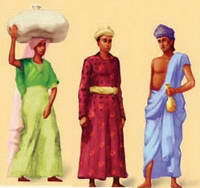 Two such groups were the Jains, believers in a religion called Jainism, and the Sikhs, believers in Sikhism. 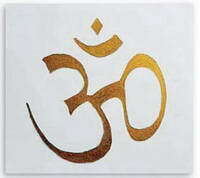 The syllable Om (or Aum) is often recited at the beginning of Hindu prayers. Om is the most sacred sound in Hinduism because it is believed to contain all other sounds. The syllable is represented by the symbol shown below. 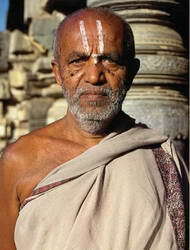 Brahmin priests, like the one shown here, are among Hinduism’s religious leaders. These priests take care of the holy images in temples and read from the religion’s sacred books.